Johnny Stocks: Looking for Shorts in all the Wrong Places? Sometimes the best time to find a good short opportunity is during a strong up market. If a stock is badly lagging a strong market then the alarm bells in your head should be going off. Take Cheniere Energy (LNG) for example. The Dow and S&P500 were each up around 3% today. Yet LNG, which initially gapped up in the morning, spent the rest of the day gradually drifting lower. Price initially found support at $10, which was previous support between the 8th and the 11th this month. However eventually this $10 support broke and the stock ended up closing the day down over 3% at 9.89 (-0.32). 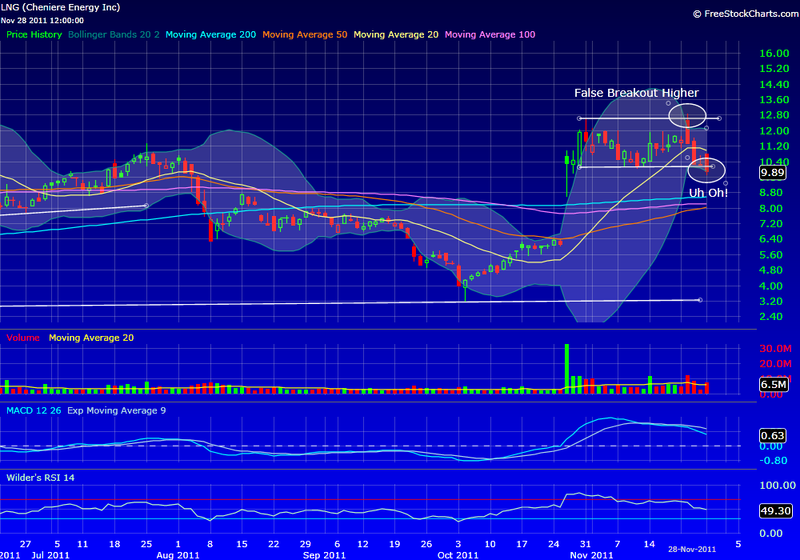 I went short LNG today @ 10.14 with a 8.00-8.50 target. The false breakout above 12.50 last week gave me added confidence that the stock was tired and may be poised for further losses. My stop is currently above 10.60 (which gives me about a 3:1 risk/reward). I'll likely lower my stop again after the open tomorrow after I see how the stock opens. A short position like this works well, particularly when you are otherwise long equities as I am. If the market continue higher then maybe LNG will get dragged higher with them and I'll get stopped. But the loss on this trade will be small relative to the gains in my other long positions. However, if the market turns and starts to head lower, a stock like LNG will almost certainly drop further than the rest of the market providing a decent hedge against potential losses on my long positions. Futures are already pointing to strong gains ahead of the European open, so we could see LNG pop back above 10 on the Tuesday open, but I would fade that move if we see it keeping my stop above 10.60.